Are you interested in creating an income online in Kenya but don’t know where to start? Have you known online to be a world full of scam and scam artists ONLY? Or do you mistrust online as a world where corny and shady network marketing activities happen? Well, you’ve been reading the wrong books and you’re not in the same corner of the internet world where I belong. The internet world where I belong, there’s something for everyone. And that something for everyone don’t be deceived isn’t only about e-commerce and writing as the viable careers there’s a lot! That’s why I decided to start an online jobs boards. Jobs, businesses strictly for Kenyans( I do my due diligence but even then, you have to do yours.) I explain what due diligence is about, I can create an entire blog post. 2. Some of the jobs are listed as Interesting Jobs of the Week, that means, that job may or may not be a Kenyan market one. Always check the details attentively. 3. Some times, I provide for you industries you can work for or with like in the case of Stella and Dot (a network marketing for jewellery) good for women and when you have a huge Facebook or social media following. 4. Other times, I’ll provide the tips to get hired. 5. 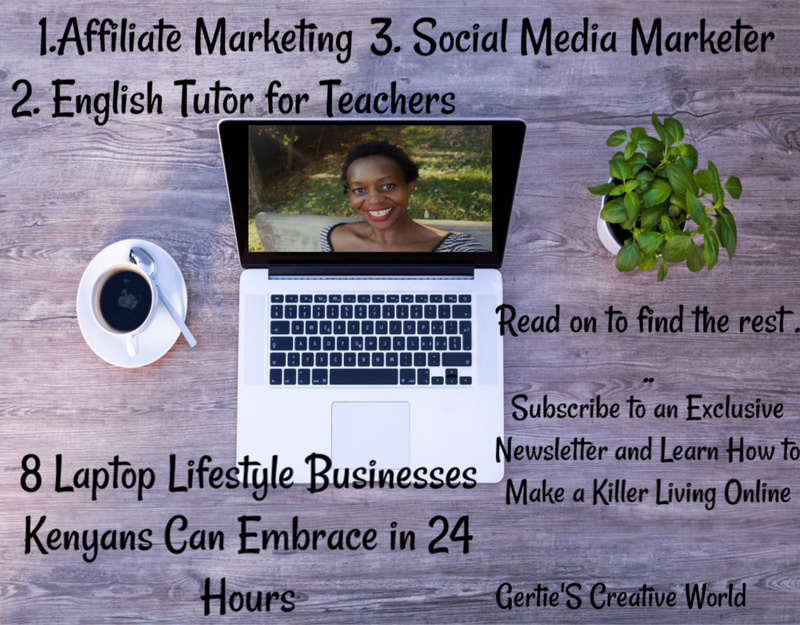 While some times, it’s strictly jobs like I did with, for teachers who want to work online. 6. Please make sure you read the instructions very well. Don’t ask me for a job, you’re applying for a job or checking the industries which you love. If I find something so niche like for teachers, make sure to share with other teachers or writers you know about. Always know, online world is as competitive as the offline world and you need to package yourself. If you need to be equipped on how to get started I have a lot of resources here on the blog, and YouTube to help you get started. There’s no need for paying anybody training money. I come in with my expertise of almost a decade now. I have patiently waited to be where I am today in the online market space. I expect for you to wait and be patient as well. I’ll always keep you abreast with the news and how things are changing in the online world and how offline world isn’t too far apart. If you’re coming on here to make a million without any work be sure to be full of disappointment. You’re about to get so pissed and call me a con-woman, but, you’ll be the one laughing at yourself in the end, because you didn’t read instructions. ”Hello Gertrude, I want in the jobs board. I am interested in seeing what the jobs are or industries advertised”. That way, I will know I’m dealing with someone who’s serious and ready for my newsletters which are so inspirational in terms of searching for jobs online or making money. I have sampled some jobs, businesses, maybe others have expired but yes, I had to include them for you to get enlightened. The more you subscribe to the Newsletter, the earlier you get job notifications. In week 2, 3 and 4 Of January 2019. Interesting Jobs of the Week for Kenyans To Work Online. 1. Social Media Marketer with Graphic Design knowledge. I thought and even labelled this one as an Interesting Job of the Week. I shared it only with the subscribers and hopefully some that are Kenyans living in the diaspora were able to apply. Also, this job with a very lucrative pay wasn’t for Kenyans. Sorry but he ONLY needed an individual from N. or South America! That’s a job hint there! Have more than one skill when you want to work online. Don’t possess a skill that everyone has, that way you’re going to have to search for a very long time or give up in the world of online or have to start earning skills. 2. Are any of you interested in earning a full time income blogging?. Well, I just realised that we don’t have internet millionaires or billionaires like in Nigeria or Ghana or America. Yet, we have very good talents in our country. Most of us never like to labour without money in hand, we have become too needy for money we forget to portray our passion. Or we don’t love to share our knowledge with others. If you’re interested in earning a full time income blogging and you’re a writer, I’ll write a few lessons and a lot of resources I have learnt. Bear in mind, I started my blog as a hobby without realising I could turn it into an income only learning about it in 2017 but actualising that in 2018! So, I’m in my early steps and hope you join me. 3. Customer Service and General Transcriptions. I have a Customer Service Course too. Geared towards the Airbnb community but can be applied in any industry if you’re to make a killing online. TIP: Plus you can use the knowledge to provide customer service assistant and call yourself as a customer service representative virtual assistant as I call myself. Only find a niche and have a combination of a million skills to boot. I provided a resource of how to market your work, then market your work diligently. This one is easy, you listen to spoken words then write according to what the speaker says. Just as they do in courts. The company provides instructions and they say in the world of transcription, ”Just follow the instructions to the letter and you’ll make a killing”. A job in the transcription industry is easy to get but as always a lot of competition is out there. Make sure you niche out. Law or medical transcription ( especially helping the coroner, medical doctors) earn a substantial amount. The only catch, you need to be in the field of Medicine or Law or take a course which is usually not less than 5000 dollars online. But a good career in gen and good skills to match too. Better start from gen. transcription and from small companies before you go big to explore other niche industries. I tried this one and failed miserably. I never tried again, I was too impatient to get ahead. Want more resource on transcription? Comment or contact me before I sample a blog post for it. Now, this one kept recurring with industries like Worldwide 101.com also hiring in the USA, Canada, Europe and S. Africa. I have extensively discussed about being a virtual assistant because, well, I’m always one providing customer service assistant to my clients making their businesses stay awake instead of automating. Have you ever wished you found a human to ask a question while looking around websites instead of a machine which answers you things you don’t care for? If you’re patient enough to deal with irate customers, join the world of customer service. I have a lot of resources on Virtual Assisting too. I’ll surely update them. There’s the new gist in town. 6. Creating your own online course! When I first saw about creating an online course, I thought, what a joke?! I actually thought I had nothing fun to teach until I realised I had a lot! Want to create an online course but wondering what this is about? This is by far the easiest way of making money in Kenya as an expert. But you have to know how to market your work, do some market research to find if your niche is interesting and make sure you have solid learning outcomes that your learners would want to achieve. Keep yourself in the know because I’m well on my way to creating my first online course ever and it’s about something I’m passionate about: the mind. I’m a psychologist so I dive in with the mind, body and spirit!. I had written a lot of resources about affiliate marketing, I don’t know where they disappeared to I have to start from scratch.. I find affiliate marketing an interesting field to dive right in if you love to sell. I know I love to sell what I buy or love shopping for and getting money in return is even more rewarding. The beauty of it is you don’t need an actual website but works well if you do. You can sell from social media or Pinterest and create a six figure plus income. Pinterest is a social media tool which I haven’t mastered yet I joined it in 2013. I have always thought it as a place to have fun looking around. If you know the ins and outs of Pinterest marketing and strategies and positioning brands in their customer’s eyes, I’m certain you can make a killing. Pinterest Virtual Assistants earn up to 2000 dollars a month! A lot for managing just one account now get 5! Choose a niche you love and are familiar with, in all industries for you to shine write about or talk about or sell what you love using, doing or eating, applying. Then you shine, excel and your passion shows through. Kept recurring and I believe I provided a wealth of resources for you to keep abreast with what teachers are doing as a side-hustle in other parts of the world. Oh well, as a person searching for jobs online, I always encourage for you to always take courses. Keep learning the ins and outs of your industry what’s changing. Because the online world keeps revolving, evolving and you never want your customers to leave your back just because. All the jobs I got during these weeks were mostly for the N.Americans and those global I had to delete them, because I’m posting this one rather too late for non-subscribers, sorry. Can’t insist enough for you to subscribe. I promise to always update you in real time. As fast as the employers post a job. That’s why I encourage you to join us because the competition for, ”Work Anywhere Jobs” is the toughest I have ever seen. These opportunities I have posted today are timeless, a way to start your business. Even a job is a business and a business a job. As always, I encourage you to apply for a job asap after it has been posted. Keeping you in the know with JOBS FOR KENYANS ONLINE is my happiness.